FuZjA 1 year, 9 months ago. If you like this ROM by MobiusM, then you can consider a donation to MobiusM, to keep him motivated. THIS IS AN INITIAL BUILD AND MAY HAVE MANY BUGS. HAVE A BACKUP OF THE CURRENT ROM BEFORE FLASHING THIS ROM AND TRY AT YOUR OWN RISK. Installing a custom ROM on a LG Spirit (c70n) requires the bootloader to be unlocked on the LG Spirit (c70n) phone, which may VOID your warranty and may delete all your data. Before proceeding further you may consider backup all data on the phone. You are the only person doing changes to your phone and I cannot be held responsible for the mistakes done by YOU. Download and Copy the GApps and Lineage OS 14.1 for LG Spirit ROM ZIP to your phone. First flash the LG Spirit Lineage OS 14.1 ROM ZIP from device. Then flash the GApps zip from your device memory. Reboot and Enjoy the Nougat 7.1 Lineage OS 14.1 ROM for LG Spirit (c70n). 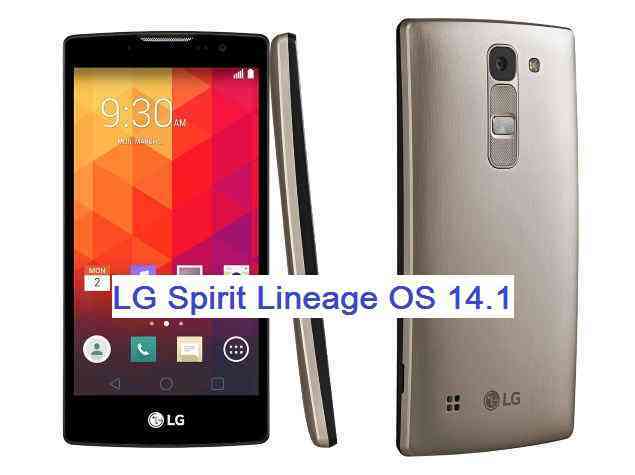 Copy the latest Lineage OS 14.1 for LG Spirit ROM ZIP file to your phone. Stay tuned or Subscribe to the LG Spirit (c70n) forum For other Android Nougat ROMs, Lineage OS 14.1 ROMs, other ROMs and all other device specific topics. Can you remount the /system partition before flashing the ROM and see if the phone boots or not?? So before the STEP d, you need to mount /system partition and then flash the ROM. i try the remount the /system partition but not working.auto recovery reboot. The above guide is for Nexus 4, but just give a try on your phone see if that works?? If the above thing does not work, then can you try flashing this ROM with the CWM recovery and see if the same problem happens?? not work with lg spirit. i install TWRP version build for mako in device.but this twrp version not compatible for spirit. @inoxentprinc: You can NEVER install the TWRP built for Nexus 4 on the LG Spirit. It may brick your phone permanently. Nowhere I said to flash the Nexus 4 TWRP on LG Spirit. I was telling you to exercise the same dd command but with the LG Spirit TWRP itself and not by flashing the Nexus 4 TWRP own LG Spirit. Whatever guide you are following, if it is for another device then you just need to follow the same set of command or sequence of steps for your own device. You cannot do the exact same thing by flashing the things meant for other device(s). Ok, Let me look around for a solution. I will get back to you when I will find one.